Over the past two decades, dental implants have become the most reliable and lifelike tooth replacement in all of dentistry. Their quality is without question, so for many, their only concern is how much they cost. A quick search on the internet will show you a wide range of numbers, but what many of them leave out is the numerous factors that can influence the overall cost of the procedure. In general, replacing a single tooth with an implant can cost about $1,000-$3,000, but even these numbers aren’t firm because every patient’s implant experience is completely different. 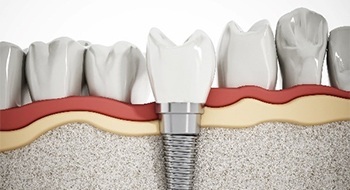 On this page, we are going to discuss the numerous things that can have a direct influence on the cost of your dental implants so you can have a better idea of what to expect. The cost of your dental implants will include both the procedure to place them as well as the materials used in the implants themselves, but by far, the biggest factor that will affect the cost is how many teeth you want to be replaced. Restoring a single tooth with an implant will cost much less than restoring an entire arch of teeth, so this is something to definitely consider if you are thinking about getting dental implants. Before placing your implants, Dr. Susan Kutis will perform a thorough exam that looks at your oral and overall health, but she’ll also be looking at the height and thickness of your jawbone. Why? In order for dental implants to be successfully placed, a patient needs and adequate amount of healthy jawbone to support the post(s). If a patient has a thin or brittle jawbone due to bone degeneration (which is very common after tooth loss), then they may need to undergo a bone graft in order to thicken it before implants can be safely placed. This additional procedure, while completely necessary, will definitely influence the overall cost of getting dental implants. In order to complete the minor surgery needed to place dental implants, many dental offices have to refer patients to an outside specialist, which tend to be quite expensive. At Blue Sage Dental, we’re proud to say that Dr. Kutis can perform the entire implant procedure from start to finish, so by simply choosing to rebuild your smile with us, you’ll easily save quite a bit of money compared to most other practices. For a long time, dental implants were not covered by dental insurance because they were considered an elective procedure, but that is starting to slowly change. Some plans now cover all or part of the procedure, and it really depends on the specific details of your plan. Our practice is happy to file claims for a long list of dental insurance plans, and we are even an in-network provider for Delta Dental Premier. Be sure to look over your plan and talk to your provider to see what kind of coverage you have. While dental implants do tend to cost more upfront than other treatments like bridges and dentures, they actually turn out to be the better financial decision over time due to their longevity. Bridges and dentures typically need to be replaced every 7-10 years, while dental implants have been shown to last for 30 or more, often making them a onetime cost for patients. This, in addition to their greater security and more natural appearance, is why all of our patients who have gotten dental implants are very glad that they did. In the end, the best way to determine how much your dental implants will cost is to simply schedule a consultation with us. At this appointment, Dr. Kutis will examine your mouth and go over all of your tooth replacement options, and should you decide to go with implants, she and our team can then discuss your financial options to make sure your new smile is completely affordable.